William Blake was born November 28, 1757 at 28 Broad Street, Golden Square, London, England. His father was a London hosier who encouraged Blake's artist abilities. In his early years, Blake insists that he was a seer of visions claiming to have seen "Ezekiel sitting under a green bough," and "a tree full of angels at Peckham.&qout; He was originally educated at home by his mother, however in 1767 Blake began attending Henry Par's drawing school where he began engraving copies of drawings of Greek antiquities. At the age of 14, Blake became an apprentice to James Basire for seven years. While studying under Basire, he was sent to Gothic churches across London to help inspire his art. After he turned 21, Blake finished his apprenticeship and became a professional engraver. In 1779, Blake became a student at the Royal Academy. There, he rebelled against the so called "unfinished style" of fashionable painters, such as Rubens. By 1782 Blake met John Flaxman, who was becoming a patron. The same year, Blake met Catherine Bouche, a poor illiterate girl five years younger. He taught her to read, write, and even trained her as an engraver. During this time, George Cumberland, a founder of the National Gallery, became an admirer of Blake's work. Poetical Sketches, Blake's first collection of poems, was published in 1783. Then in 1788, at the age of 31, Blake began practicing "relief etching", also known as illuminated printing, which he later used to produce four books; Songs of Innocence and Experience, The Book of Thel, The Marriage of Heaven and Hell, and Jerusalem. Blake's belief was that self-published books would liberate the artist and author from the tyranny of censorship by the Church and State. Around this time, Blake befriended painter John Henry Fuseli. Early in Blake's marriage, there were a few problems, like every marriage. The largest problem of all, was that of the couple's failure to produce children. Blake suggested bringing in a concubine, however changed his mind after Catherine showed distress at the idea. Around 1800, Blake moved to Sussex at Felpham (now known as West Sussex) to take a job illustrating the works of William Hayley, a mediocre poet. While in Sussex, Blake wrote Milton: a Poem which was later published between 1804 and 1808. The preface included the poem And did those feet in ancient time, but was discarded in later editions. Ironically, this was one of Blake's best-known and well-understood poems as the words were later used in the hymn Jerusalem. In 1802, Blake returned to London and began to work on Jerusalem. He was introduced to a young artist named John Linnel, who in turn introduced him to Samuel Palmer, who belonged to a group called the "Shoreham Ancients." The group shared Blake's beliefs on modern trends. He also learned new advances in watercolor painting and found an audience willing to hear his ideas. Shortly after, Blake began his illustrations for the Book of Job. John Ruskin likened the works to Rembrandt. 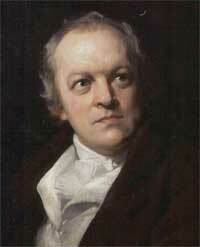 William Blake died on August 12, 1827 and was originally buried in an unmarked grave at Bunhill Fields, London. Since then, he has been given a proper memorial for him and his wife. Blake was a loving and caring soul who was misunderstood by the world, except by a select few. He lived a cheerful and content life of poverty filled with visions and dreams. Blake sums up his life best by his statement "The imagination is not a State: it is the Human existence itself."